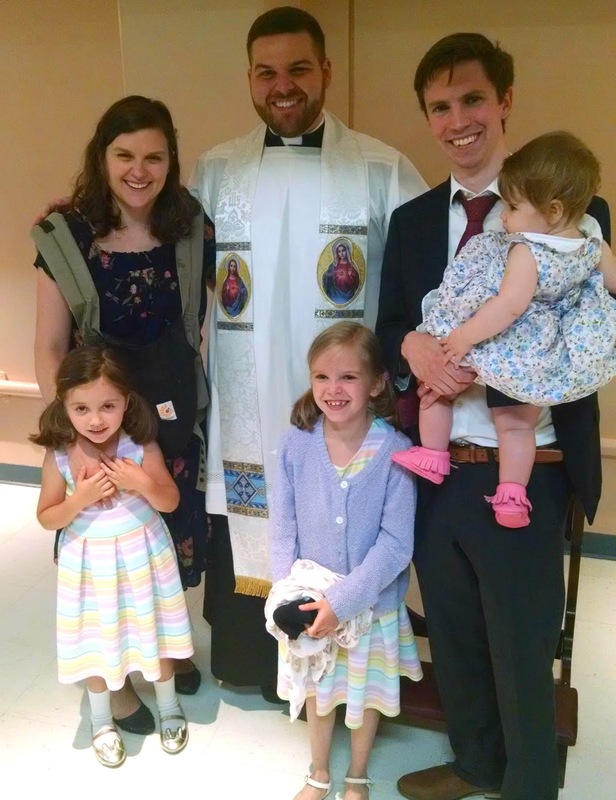 This past weekend, our family finished off ordination season by going to the ordination of our dear friend, Fr. Taylor Leffler, in Omaha. 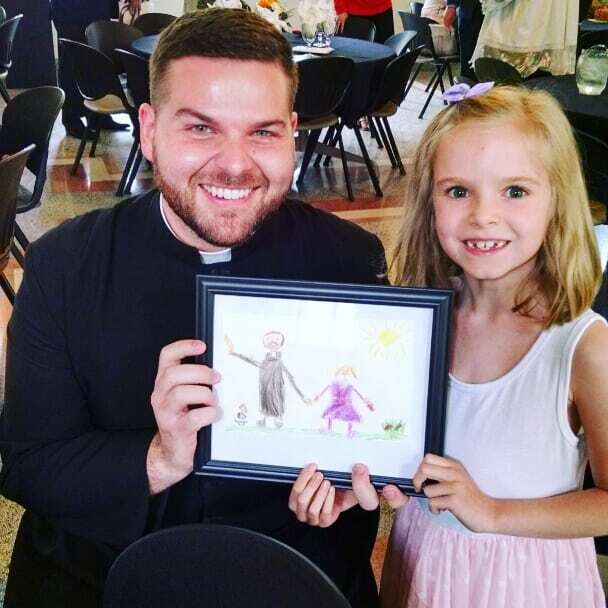 Taylor was the very first seminarian we befriended, when Andrew first started teaching at the seminary (four years ago!). He was a newly minted "theologian" (the term for the guys in seminary who are studying graduate theology and are in the four years leading up to ordination). His ordination was one of the most emotional I've experienced. The Mass itself (and his packed dinner reception) were incredibly beautiful. But to see this young man who we have welcomed into our hearts enter into this vocation...there are no words. I can't begin to put into words how much I love all four of my children. Even on the days when motherhood is really hard, I am so, so grateful for them. I can't believe that we have four children, especially knowing that we went into marriage not knowing if we would be able to conceive (and having a difficult time conceiving initially). But here they are, and they are so beautiful. Therese, Maria, Gabriel, and Zelie. I can't believe four little ones have lived in my womb. I don't want to sound ungrateful, but I wish I could have more. I wish I could be one of those people who is able to just take babies as they come. I wish that being pregnant didn't literally make me feel like I was dying. (And, in all honesty, if I wasn't living in modern times, I actually could die from hyperemesis gravidarum. HG is no joke.) Sometimes, I don't understand why God has given us the cross of HG pregnancies. But recently, I've been feeling the Holy Spirit increasing my awareness of a different vocation He has called me to - spiritual motherhood. 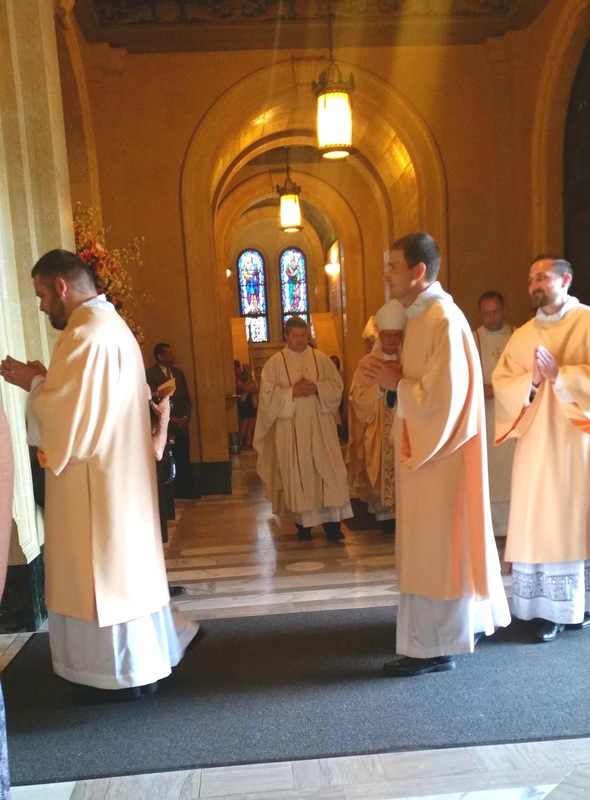 In particular, I feel called to spiritual motherhood to priests and seminarians. Recently, (I think it was actually when I was talking to Fr. Taylor) I remembered a story from over a decade ago. I was an undergraduate at the University of Notre Dame. I think it was before I met Andrew, and I was in the midst of trying to discern where God was calling me. I felt such a strong call to holiness, and I assumed that meant that I would have to be a nun. But I didn't feel called to religious life. I felt called to marriage. That made be feel guilty, like I was somehow taking the easy way out, or something. (Which is hilarious, in retrospect.) I remember trying to bargain with God. I remember praying in my dorm chapel, late at night, about this. I knelt before Jesus in the tabernacle and told him, "Okay, my Jesus, if you are calling me to marriage, then how about you give me a son? And you can call him to be a priest. Please, give me a son that is a priest." When I was pregnant with Gabriel, I really thought he was my boy. Andrew was already teaching at the seminary at that time, and I imagined that the baby in my womb - possibly a son! - might one day be called to the priesthood. Then, we lost Gabriel. He was called to a different kind of priesthood. But, right before we lost Gabriel, Andrew was hired on as a full-time professor at the seminary. It would become his job for the foreseeable future. 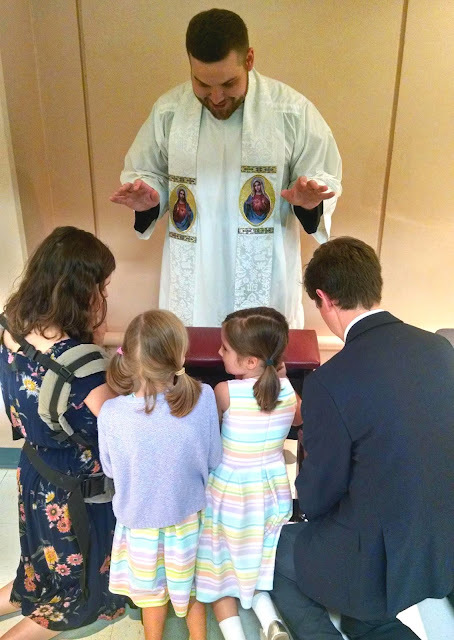 Unlike an ordinary teaching position, the seminary is a family vocation. The rector of the seminary is a wise man who knows that friendship with families is an important part of forming future parish priests. From the beginning of our marriage, Andrew and I have felt called to the charism of hospitality. Welcoming these guys into our hearts and prayers (and sometimes over for dinner or yardwork) has been a very natural fit for our family's vocation. Having a background in theology, I have especially enjoyed getting to support Andrew in his work at the seminary. In the beginning, being connected to the seminary was just plain fun. It was fun hanging out with the guys, and getting to know them. It was fun praying for them. It was fun having so many priests and future priests in our lives. This past year, the seriousness of this is beginning to hit me. In particular, the Holy Spirit began making it clear to me that He was calling me to become a spiritual mother to these guys. I have a friend who promotes spiritual motherhood to priests in our archdiocese, but I felt called to something more. I felt called to spiritual motherhood of seminarians, too. Like with regular motherhood, this means praying so much for all of these men. It means knowing such joy when I see them ordained. It means enjoying seeing them grow and flourish. But is also means being open to heart ache. It means accepting that some of the men we befriend will discern they are not called to the priesthood, and will leave the seminary to pursue other vocations. 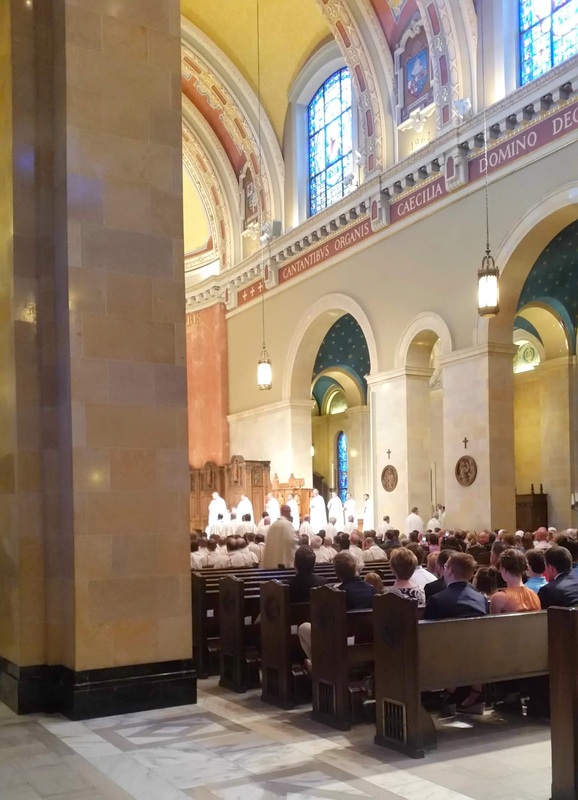 It means others will be ordained to the priesthood, and will leave the seminary to live out their vocation to the priesthood. One of my best friends is a foster mother. She's described the emotional rollarcoaster of foster mothering, and the need to love intensely, even knowing that you will lose that child from your life. In fact, if you do foster mothering well then that child will be removed from your care and reunited with his or her family. That is a success story. This past weekend, seeing our dear friend being given back to his diocesan family, I knew that we had succeeded in helping support him through his formation. 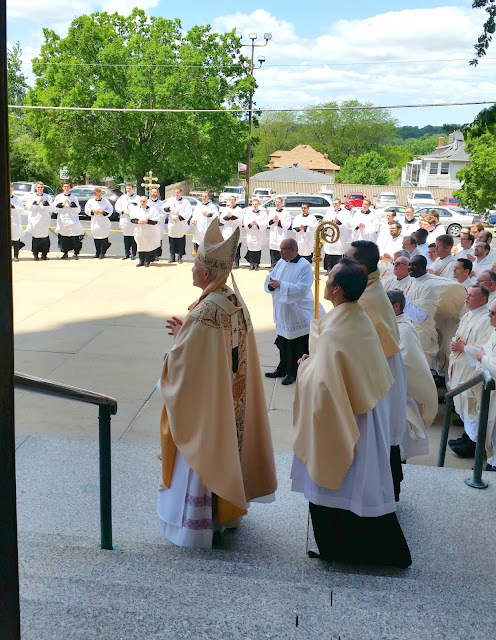 I saw him flourishing, and I saw the joy of the people of his diocese, as they embraced him. But my heart was also breaking, knowing that we had to let go. It was heart breaking knowing that this is what our family's vocation is. We are called to love these guys intensely, knowing that - one way or another - we will have to let them go. Knowing that, we can't love them any less. We have to keep befriending them, praying for them, opening up our hearts and prayers to them. We have to do that, knowing that if we succeed, they will leave us. They will either leave to discern a different vocation, or they will leave to be ordained to the priesthood. But, either way, they will leave. But in the midst of this all, I realized that God had answered that old prayer of mine. In fact, he had answered it abundantly. I wasn't called to be the mother of a priest. I was called to be the mother of hundreds of priests. But I also couldn't have imagined the sorrows and the separations and the seriousness of taking these men and their intentions into my heart. In a way, mothering Gabriel prepared me for this particular vocation. I wouldn't know how important it was to let go and give a "child" (spiritual or otherwise) back to God, if it wasn't for him. I wouldn't have realized that I was only a small piece of their journey, and that that's okay. or two who needed them. I wouldn't have the emotional energy to invest so much time and so many prayers into friendships with these guys. I look back over the course of my life, and I know that this spiritual motherhood is something that God has been preparing me for all along. I am in awe of this unexpected vocation. But that doesn't dull the pain of having to say good-bye to these guys. It also doesn't begin to describe the joy of seeing them live out their vocations. And, in this vocation of mine, God has done the unexpected. He has given me sons to love and pray for. He has given me the grace of spiritual motherhood.